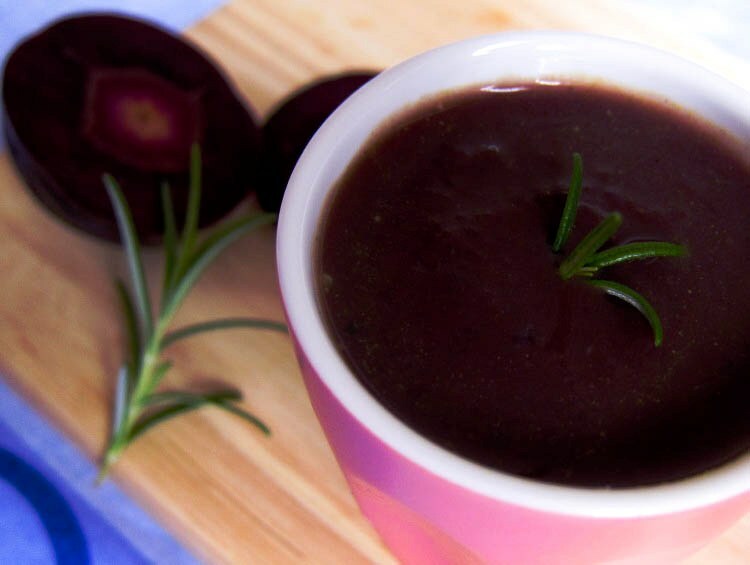 purple carrot soup with ginger, rosemary and coriander seed. Grocery shopping is often regarded as a chore by many, but I love it. At any given opportunity, I spend a ridiculous amount of time comparing the prices, nutritional values and other perceived qualities of even the most ordinary of food items. When I come across something that gets my mental-recipe-ideas-gear going, though, I am often happy to set aside the obsessive-compulsive part of my personality and just go for it. It's sorta like how you'd throw out silly dating checklists when you feel the right chemistry with someone, you know? And that was how it went when I saw this rather fetching purple carrot a few days ago. I'd seen purple carrots before, but while they inspired a mild curiosity in those previous occasions, I never took things to the next level. That day, something just clicked. So I did it. I picked him up, I brought him home, and I ate him... and yes, we're still talking about the purple carrot. And no, that is NOT an euphemism. Sheesh, get your minds out of the gutter. chopped up purple carrot. please excuse the bad, garish artificial lighting. - Heat up the olive oil in a saucepan and fry the shallots until they brown at the edges. Add in the garlic, ginger, rosemary and and ground coriander seed and fry until fragrant. - Add carrot and potato pieces. Pour in the water and vegetable stock, bring to boil, then simmer, partially covered, for 30 minutes. - Let it cool for 10 minutes and then puree in a blender in small batches. You may blend all of the mixture for a smooth soup or half of it for a semi-chunky soup. - Return the soup mixture to the pot and continue to simmer for another 10 minutes. - Season with salt, black pepper, and a drizzle of balsamic vinegar to taste. *This makes a light, yet still deliciously comforting soup. For a rich, creamy, non-vegan version, add cream to the soup at the step where the pureed soup is returned to the pot. Or you can still keep it vegan, and use coconut cream instead. Either way, the soup should turn a pretty pastel purple, and taste quite luxurious! This soup was warm, gentle and sweet - all the qualities you want in a lover. In case you were wondering, though, purple carrots taste much like the regular orange ones, so you don't have to hunt down a purple carrot to enjoy this recipe! The purple is stunning, however, and of course, there's that novelty factor. Sometimes you just want to have a fling with a purple carrot... and there's nothing wrong with giving in to your hungry desires. Nothing at all. 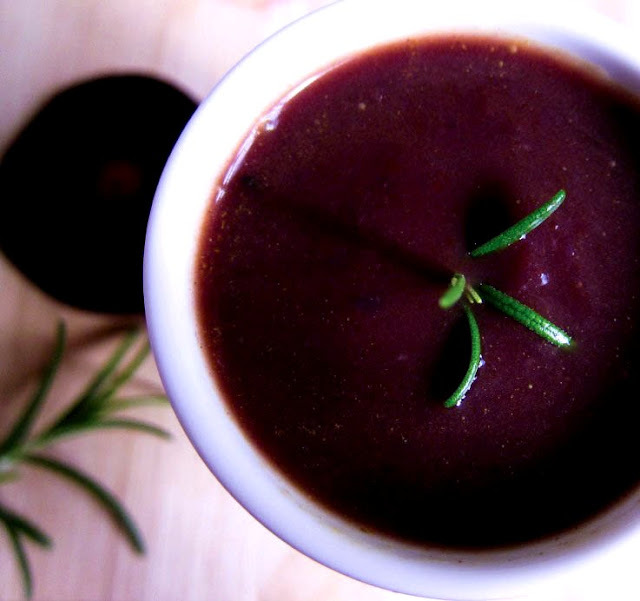 purple carrot soup with rosemary, ginger and coriander seed. Love grocery shopping and love purple vegetables!! Anh, indeed - the colour was definitely the purple carrot's biggest attraction! Lovely it looks but sad we don't have purple at where I am, maybe can substitute with beetroot, am not sure if this will give the same taste. Well, I will definitely eat this. The colour is so lovely! The purple is so intense! Love it. Nava.K - it certainly won't taste the same, but it could still turn out pretty and delicious! 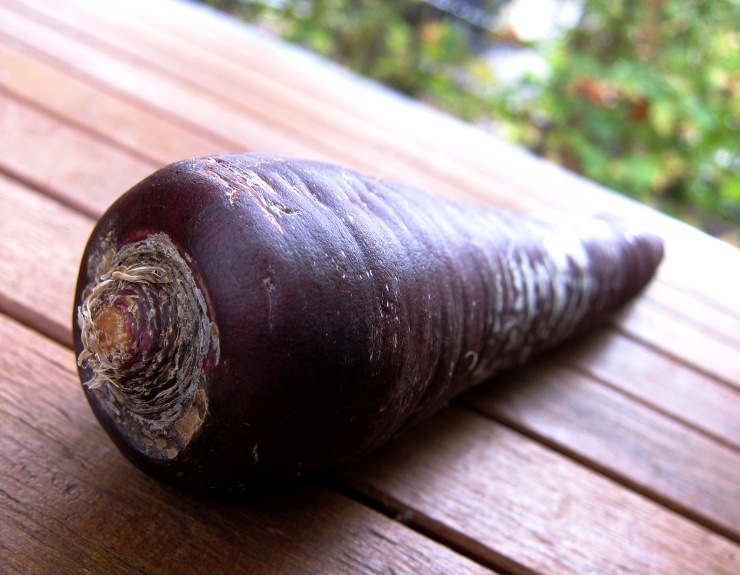 My gradma used to make a beverage with purple carrot, soup is new to me..lovely color! I'm mesmerized by the bold color of this soup. Newest follower, looking forward to learning more about you and your food. Must be a nutrient powerhouse too! Mmmmm, that looks amazing! And the carrots are gorg. Wow those carrots are so richly colored! How fun. Love the purple colour. I have seen some purple carrots at the farmers markets recently. Might have pick myself up some. I adore this heirloom variety. Not only they look gorgeous, but taste delicious as well. This soup sounds fabulous! Oooooh pretty! Such a gorgeous colour. oh I love the deep color in that! Thanks Agnes and Simply Life! Ditto on the shopping for food, especially at farmers markets. I have children and they love to help plant different veggies. We grew purple carrots last year and if I remember correctly, they are called Dragon carrots. They were delicious raw, now I think I need to run to the nursery for some more Dragon carrot seeds to make this soup. Beautiful color! Happy to have come by your blog. Nicole, thanks for coming by! 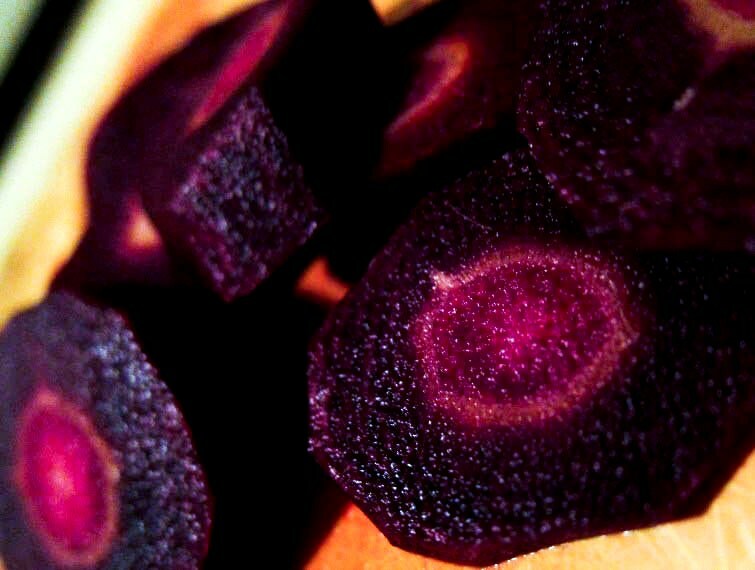 Love the name Dragon carrot... though after doing some research I think the one I used might be the Deep Purple variety, as it is purple inside while others seem to still have orange insides. Hi, quick question about the amount of ginger one is supposed to use in this recipe. I'm not familiar with what "1cm" is. Is that a weight measurement? This recipe looks great, but I'm afraid of adding too much ginger.